Gentlemen start your engines with this large vintage race car painting. Although you might have to wait for this gentleman to finish painting his car. That’s right, one day he decided to paint his car blue. While he was at it he also decided to paint his favorite lucky number eight on the side. I’m afraid to see what he might do next but so far I like the changes. Alone in the garage with his car this man is having a great time. I like that he is painting the car in style. A white dress shirt, pressed black slacks with matching suspenders. This man came straight from work to the garage. No wasting time to go home and change or have a quick bite to eat. He sat in the office all day at his desk dreaming about painting this car. He knew just what color he wanted and I think he got it right. He went into the garage, rolled up his sleeves and got to work. A long drag on his cigarette and another swipe with the paintbrush. The paint went on easy. No phones ringing, no meetings and no interruptions. Definitely no cell phone. This is one happy camper. I don’t think he minds that the paint needs to dry a few days before he can take the car out on the open road. He enjoys the time spent making his car looks it’s best. There will be plenty of time to hit the road. You too can enjoy that feeling with this vintage race car oil painting. Hang it on the wall at home and live the dream every day. They’re off. 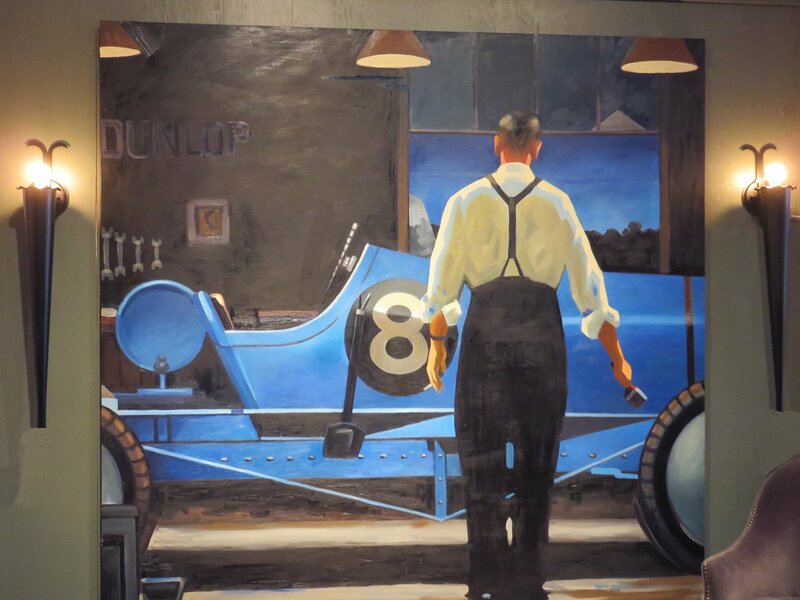 Click HERE to view Large Vintage Race Car Painting at Hudson Goods. And click Hip Lighting, Furniture Frenzy, Industrial Strength or Chairs Gone Wild for more interior home design.